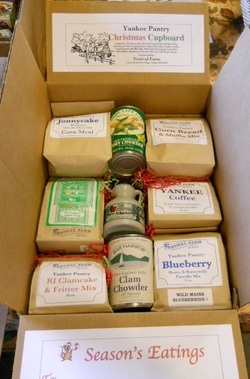 It's time for holiday gift giving and the Yankee Pantry is the place to go for unique New England food gift baskets and boxes - ready to ship (boxes only)! 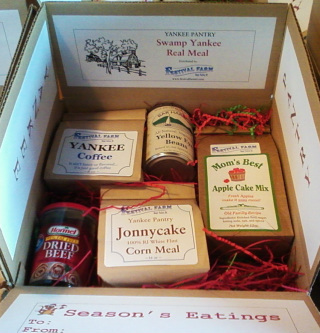 Pictured is the Yankee Pantry Christmas Cupboard gift box, chock full of delicious treats including RI grown and ground Jonnycake Meal, Corn Bread & Muffin Mix, Apple Crisp Mix, Clamcake & Fritter Mix, Blueberry Pancake Mix, Corn Chowder, Clam Chowder and Maple Syrup! $39.95 + Shipping. Other gift boxes shown below. Call us at 401-742-5575 or email festivalfarm@gmail.com for ordering information. MC/Visa accepted!! When Fall arrives you know it won't be long before you'll be looking for some special gifts for the holidays! 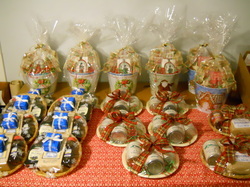 There's nothing like a gift basket from the Yankee Pantry! Creative, unique and delicious New England made food products beautifully gathered for a gift that anyone that likes to eat will love! Stop by our Country Store and check out our individual baking mixes and jams and jellies too!